We begin again, regenerated by a new Belief in the Power of Love. Tone 1 reflects the Unity of Spirit. We Ascended with a Higher Consciousness of our Power to Shine in the Darkness. Holding the Light Shared by the Creator, we can Create anything we can Imagine. Road/EB is the Day Sign of Human, and the Sign of Destiny. The glyph illustrates the “road to destiny” on Human’s head. We define our own future by the Choices we make. With a Higher Consciousness of Divine Power, we’re offered a new beginning, a new way of living, Choosing to Believe in our Power of Creation. We will be guided by Road/EB, the Day Sign of the Human and the Road of our Destiny, to live our lives in Consciousness of Gifts we were given. We were empowered to make the Journey of Life in Harmony and Equity, through a Choice to live under the protection of a Divine Authority. Road/EB is willing to make a personal sacrifice for others, often serving as the caretakers of the poor, the sick, and the elderly. We can begin a new life, Knowing our Power to uplift the journey of the Whole. Road/EB will guide us on the new Road of our Destiny. We’re more than half-way through the 5th Uinal of Empowerment. We were Transformed by a new Consciousness of Divine Power, and complete our Empowerment on 9 Sun/AHAU with a new Revelation of Being. In the 6th Uinal of Flow, we will establish the momentum of Divine Movement. Human Loving, Human Sharing, and Human Forgiving will become a new way of life. 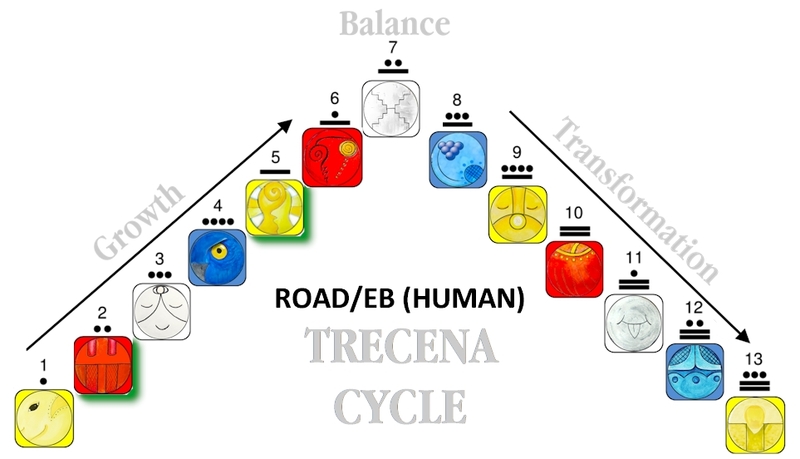 The Road/EB trecena offers 2 Portal Days. Portals thin the veil to the dimension of Spirit. These are days when we are likely to experience our Supernatural Gifts of Spirit and feel our connection to the Creator. On 2 Reed/BEN, a portal will magnify our Passion for a new Intention. On 5 Wisdom/CIB a portal will magnify and Empowerment of Spiritual Wisdom and our connection to the Ascended Masters. 6 Earth/CABAN – we are synchronized with Mother Earth through a Rhythm and Flow of Movement. 7 Flint/ETZNAB – will be Balanced by a Revelation of Truth that was hidden, to sweep away the darkness. 8 Storm/CAUAC – the lightning energy of Storm/CAUAC is exalted in its zenith position, for a Higher Renewal and Regeneration of Spirit that will Transform us again. 9 Sun/AHAU – our Transformation is completed by the Supreme Creator who will share the Power, the Light, and the Human Will of Determination. The Road/EB trecena offers an opportunity to experience life as Divine Humans Being. As a trecena of “darkness,” we apply the Consciousness of our Power to create a New Life of Harmony and Equity. The Cherokee Day Sign for Road is the Rattlesnake Tooth, symbolized by the rainbow, a delicate display of the electromagnetic rays of the Sun. The rainbow illustrates a promise that connects Heaven and Earth. The Rattlesnake Tooth was a shaman’s tool of Spiritual Medicine, used to break the skin in a Sacred Ceremony of Healing. When we choose to identify as a Child of the Creator, we are marked by a Sign of our Holy Spirit. The Road/EB glyph illustrates the milestones on either side of the Road of Human Destiny. We are guided to mark the milestones of our transformation. When we are lost in the dark, we have an experience to go back to, to find our way again. Milestones also offer us the evidence of our progress and the major turning-points of our journey. Road/EB offers the Opportunity for a new way of living. With a new sense of our Divine Identity, we can draw on a Higher Power of Love. Through a Relationship of Divine Spirit, our choices will be guided by the Divine Trinity of Heart, Mind, and Spirit. Road compels us forward to the Journey that defines our Destiny. Human is the “bearer of time.” We bear the time we must walk through the darkness. We will Create our own Light by what we Choose to Believe. On Tone 1 we begin our Journey in Unity with the Creator. The Passion to manifest Creation is ignited by a Meaning and Purpose. Today a Call from the Creator will inspire a Reason to Create. An Expression of Love holds the Promise of Manifestation, as the Highest Divine Aspiration. A Passion of Love will hold the Light to see us through the darkness of the Unknown. Our Ascension on 13 Monkey/CHUEN, raised our Consciousness to the Unlimited Power of Creation made possible through a Communion with a Creator of Almighty Authority. The Joy we would manifest creating our Wildest Dreams, will ripple through the Whole. In Unity with the Creator, Tone 1 offers the energy and vibration to Believe that Anything is Possible. Today’s Divine Movement is “Human Imagining.” As a Child of Divinity, we’re guided to imagine all things without reasoning the possibility. We flow with this vibration by allowing our Self to Dream. Our Inspiration may be a Revival of an Old Dream that’s gathered dust on the shelf. We may have lost our Passion, and are inspired by new Possibility. Dreams we abandoned were left in sight because we identified them as Dreams that called to our Spirit. We may be inspired by a more important reason to Create. Road/EB will navigate the Road to our Destiny. It makes sense to mark a milestone today, noting what we Believe and the Reason we Believe it. As we face the darkness of Spiritual Growth, we can return to it to remember our Reason to Hold Faith. Road/EB, the Day Sign of Human, resides in the South, the Direction of Relationship. We will forge a new relationship with the Creator through an Experience of Creation. We can initiate our Self into a Journey of Darkness, Believing in a Promise that connects the Power of Heaven on Earth. The South represents our Relationships with One Another and with the Natural World. Road/EB offers a Healing of Right Relationship. The Intention of each trecena is guarded by the Destiny Kin of Ascension. 13 Seed/KAN is the Divine Promise of the Road/EB trecena. We are promised a new Belief to fulfill our Heart’s Desire, by the Divine Spark that was embedded in the Seed of our Spirit. 13 Seed/KAN promises the Wisdom of an experience, led by an Intention of living in Integrity with our Divine Design. To all my relations, may we make note of where we are, and the Divine thoughts that call to our Mind, Heart and Spirit. May we draw ourselves into the Sacred Communion of Divine Consciousness to hear the Inner Voice that inspires us to Love. In Unity, may we Know a Love beyond Human understanding. As we Dream a new way forward, may we rely on the Power of Divine Love to guide us. May we prepare to take a Leap of Faith, believing in the Magic and Power of Love. I’m grateful for a new beginning and the chance to live again knowing the Power of Love to manifest Creation. thank you. more than you know.